The WAC opened up conference play, and after two games, there are three teams atop the leaderboard with 2-0 records. Utah State opened 2-0 as expected, however, Boise State and an even bigger surprise, Fresno State, are also 2-0. New Mexico State has the league’s only road conference victory, winning at Idaho, 74-69. Off to disappointing 0-2 starts are San Jose State and Louisiana Tech, both of whom opened conference play on the road. No team had a worse first week than Louisiana Tech, which was blown out by both Boise State and Idaho, 71-60 (the Bulldogs trailed Boise State 36-14 at half) and 77-47, respectively. Utah State’s Tai Wesley was named the Player of the Week for the week of Dec. 27-Jan. 2 as he led Utah State to a pair of WAC home wins against Hawai’i (74-66) and San Jose State (80-71). Against the Warriors, Wesley posted his fourth double-double of the season tying a career-high with 27 points to go along with 13 rebounds. Wesley was 8-12 from the field and a perfect 11-11 at the free throw line in 38 minutes of action. Against the Spartans, Wesley scored 16 points, grabbed eight rebounds, dished out four assists and blocked three shots. In a spectacular outing from the floor, he shot 5-6 from the field and 6-8 at the charity stripe. For the week, Wesley averaged 21.5 points, 10.5 rebounds, 2.0 assists and 2.0 blocks per game. He shot 72.2 percent (13-18) from the field and 89.5 percent (17-19) from the free throw line. Yes, the UtAgs are 2-0 in conference play, however, they were pushed to the brink by Hawai’i and to a lesser extent, San Jose State. USU needed a career night from Tai Wesley (27 points, 13 rebounds) to get by Hawai’i as the Warriors trailed Utah State by just three with 42 seconds left in the game. Utah State’s defense was suspect, allowing Hawai’i to shoot 63.2 percent for the game, but a 32-13 rebounding advantage (including 18 offensive boards) allowed the Aggies to escape. Rebounding again played a key role in their victory over the Spartans as they held a 40-26 advantage. The Aggies’ defense in the first half allowed 48 percent shooting by the visiting Spartans, but they clamped down in the second half allowing just 38.7 percent shooting by the visitors. USU hits the road for a single game as they head to Reno to take on the Wolf Pack. The Broncos made a statement that they will be a team to contend with in their final season in the WAC. Boise State stifled Louisiana Tech in the first half, allowing just 14 first half points en route to a 71-60 victory. Against New Mexico State, it was a stellar second half defensive effort that propelled them to an 81-78 come-from-behind victory as they held the Aggies to just 37.5 percent shooting after allowing NM State to hit 69.6 percent of their shots in the first half including eight three pointers. Boise State forced three straight Aggie turnovers late to turn a tie into a five-point advantage and held on for the victory, hitting seven of nine free throws down the stretch. The Broncos take to the road, where they’re just 3-4 this season. They’ll face two teams in San Jose State and Hawai’i that are desperate for conference victories. Are the youthful Bulldogs stabilizing and moving forward? After spending the bulk of the non-conference at the bottom of the WAC standings Fresno State’s 2-0 start has to be a surprise to even the most loyal of Bulldog fans. Fresh off a solid 75-62 home win over San Jose State — with Greg Smith finally as the leading Bulldog scorer — Fresno State entertained Nevada and notched another conference victory, 80-74. Smith and newcomer Tim Steed have individually highlighted these past two games. Smith finished with 15 points and nine boards against the Wolf Pack plus 16/8 in the SJSU matchup and Steed posted 20/6 against the Wolf Pack and 16 and six against the Spartans. Newly returned to eligibility, point guard Steve Shepp has a marvelous 12/1 assist-to-turnover ratio. Next, it’s hitting the road to Ruston to play Louisiana Tech and then moving over to Las Cruces and New Mexico State. An unrequested memo to the Bulldog perimeter players: If the team wishes to have a chance on the road, KEEP GETTING SMITH THE BALL. Steve Cleveland‘s squad is 5-2 at home but just 1-4 on the road although falling to Colorado State, Utah, UC-Santa Barbara and BYU falls short of venial sin qualifications. Injuries are a definite concern for the Bulldogs, as Steed could miss both games of the road trip after suffering an ankle sprain against the Wolf Pack. The Aggies came this close to notching a road sweep, but after coming from behind to defeat Idaho by five, the Aggies could not overcome three late turnovers at Boise State and lost, 81-78. The Aggie offense has been uneven in the first two conference games. They shot a dismal 29 percent in the first half at Idaho, but then strung together two white-hot halves shooting 63 percent in the second half against Idaho and 69.6 percent in the first half against Boise State. The roller coaster continued, as the Aggies cooled off considerably, shooting just 37.5 percent in the second half against the Broncos. Troy Gillenwater’s return to the lineup had an immediate impact, as he scored 22 and 24 points respectively on the trip. Also returning from injury, though having less of a scoring impact, was center Hamidu Rahman. One Aggie who will not be returning to action this season is preseason First Team All-WAC selection Wendell McKines. It was announced this week that McKines will redshirt this season and return for his senior season in 2011-2012. McKines suffered a foot injury in preseason practice and has not seen action on the court this season. The Aggies host Fresno State on Saturday night where they’ll try to “hold serve” at home in the league race. The Vandals split a pair at home, losing to New Mexico State 74-69 then clobbering Louisiana Tech, 77-47, two nights later. Despite shooting 53.6 percent in the second half against the Aggies, the Vandals could not hang on to a two-point halftime lead falling behind by as many as eight points late in the second half. The Vandals did cut the Aggie lead to two points with 1:33 left and again with 14 seconds left but a missed layup by Landon Tatum with four seconds left sealed their fate. Idaho took out their frustrations on Louisiana Tech putting together an impressive defensive performance as they held the Bulldogs to 28.8 percent shooting for the game and just five buckets in the second half. Idaho got 20 points from Jeff Ledbetter on 6-7 shooting (3-4 from three point distance). Up next for the Vandals is a road trip to Hawai’i and San Jose State where like Boise State, they’ll be facing a pair of teams desperate for a conference victory. Just two nights after Utah State struggled with Hawai’i, the Wolf Pack easily dispatched of the visiting Warriors, 86-69. Olek Czyz and Dario Hunt each scored 23 (both on 9-13 shooting) while Malik Story added 18 all on three pointers (6-11). The 86 points was a season-high for Nevada. The Wolf Pack’s first road trip in conference play resulted in an 80-74 loss despite 26 points from Czyz and 50 percent shooting from the team in both halves. The Wolf Pack trailed by five at the break but took a 58-56 lead with just under eight minutes remaining in the game, however, the Bulldogs would pull away slowly sending the Pack to defeat. The Wolf Pack hit just 2-11 three point attempts in the second half. UH played Utah State tough (74-66) in The Spectrum, a veritable death chamber for opposing teams, but fell apart later on in Reno, allowing a young Nevada team to put up 86 points while scoring 69. Now it’s Idaho, followed by Boise State coming to the islands and momentum needs to be regenerated by the young Rainbow Warriors. Leading scorer Zane Johnson has been en fuego of late with his shooting touch (10-16, 6-9 from three the past two games) but fellow perimeter player Hiram Thompson needs to shake off his back woes. The world isn’t awaiting the return of forward Bill Amis (foot injury) but head coach Gib Arnold and the Hawaii hoops fans sure are. Having the solid frontcourt scorer and rebounder available will only open up more outside opportunities for Arnold’s guards and wings but Amis’ latest problem is strep. At least it’s not strep foot, if such a malady is possible. Amis returned to practice on Tuesday, a welcome sight for Arnold and an unwelcome sight for the eight other coaches in the WAC. A loss on the road to Fresno State (75-62), followed by another to Utah State (80-71) have the Spartans at a critical juncture. Boise State comes to town followed by Idaho this week and San Jose State needs to even up its conference record. The flu slowed down Adrian Oliver last week scoring a pedestrian (by Oliver standards) 15 and 18 points respectively but he should be free and clear of symptoms from here on out. Newcomer Brylle Kamen is the best-shooting frontcourter to date on the squad this season but the Spartan Big Three (Kamen, Will Clark and Matt Ballard) all remain below 40% at 38%, 37% and 25% respectively. Louisiana Tech’s dismal showing on the road cannot be understated. After getting pummeled in the first half by Boise State (36-14), the Bulldogs had to have felt a little better about themselves as they headed to Moscow after shooting 55.6 percent in the second half against the Broncos and making a blowout look a bit more competitive. However, that was not the case as the Bulldogs were shellacked by the Vandals, 77-47. LA Tech hit just 15 buckets for the game and hit just five in the second half (5-22), a fate they suffered in the first half against Boise State (5-25). DeAndre Brown had 24 points against Boise State and 13 against Idaho and Olu Ashaolu finished with 15/10 and 9/8 respectively but there wasn’t much help for those two from their teammates. The Bulldogs have just one game this week, The Battle for the Bone (Part I) as they host Fresno State who comes in riding high after opening league play 2-0. Week Two in the WAC provides some interesting matchups and some desperation games for some (San Jose State, Louisiana Tech and Hawai’i) while the home teams try to hold serve (just one home loss through the first nine conference games). Fresno State at New Mexico State, Boise State at Hawai’i and Utah State at Nevada highlight this week’s games. The top six teams in the WAC are 34-13. The other three are a miserable 5-18 and two of those five victories are over non-Division-I teams. New Mexico State and Nevada, two teams accustomed to playing in the top third of the league are currently on a combined 13-game losing streak. 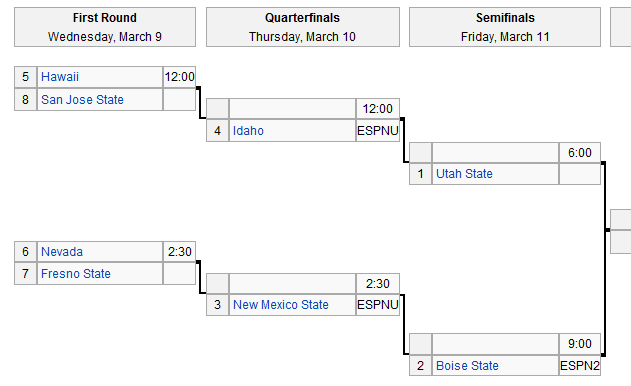 The Wolf Pack are losers of seven straight, while the Aggies are losers of six straight. Both teams had schedules that, if they had navigated them with an above-average winning record, could have lent themselves to a potential at-large berth. However, as they limp toward the middle of December, their combined record of 3-13 has guaranteed the necessity of winning the WAC Tournament to receive an NCAA bid. None of the other teams have done enough to warrant at-large consideration, despite the solid records. Utah State has come up short in both of its resume-boosters (BYU and Georgetown), meaning that the league will likely go back to being a one-bid league this season after seeing both Aggies dance last season. San Jose State’s Justin Graham earned his first career Player of the Week honors after back-to-back 20-plus point outings, also a career first. Graham posted 20 points with a career-high 11 rebounds, five assists and three steals in a 72-63 loss at UT-San Antonio. Graham led the Spartans with 21 points, a team-high five assists and four steals, plus six rebounds in 37 minutes of play in an 85-70 road win at UC Irvine. 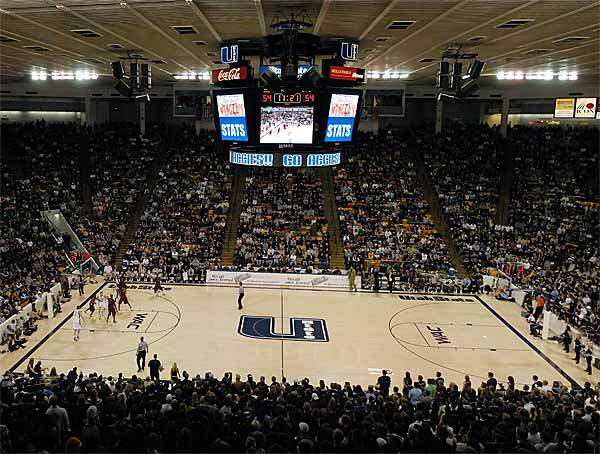 The cream has risen to the top so to speak as the Aggies have won four of five defeating in-state rival Utah 79-62, holding off Northeastern 56-54, and escaping Denver 61-53 before losing 68-51 to nationally ranked Georgetown. The Aggies rebounded from the loss by pounding Long Beach State 81-53. Brady Jardine has led Utah State in rebounding in five of their eight games so far and enjoyed career-highs in points and rebounds against Utah before backing it up with a 15-point, 13-rebound performance against Northeastern. The UtAgs are experiencing a rare statistical oddity, as opponents are outshooting the Aggies from the three point line so far this season, hitting 36.4 percent to Utah State’s 36.0 percent. The Roadrunners from Bakersfield invade Logan for what should be another victory for Utah State. The Broncos tasted their first defeat under head coach Leon Rice, as they were tripped up by Long Beach State 69-66, losing a 12-point lead with 9:22 left in the game. While their success has come at the defensive end, holding opponents to just 55.0 points per game while scoring 72.0 points per game themselves, in the loss to LBSU they allowed 48 second half points to the 49ers. Despite holding a 7.0 rebound per game advantage on their opponents, just twice in their first six games has their leading rebounder been in double-digits in the category. The Broncos are rebounding from every position, and no player is averaging more than 4.9 rebounds per game. Things will get significantly more difficult in the next week as the Broncos take to the road to face nationally ranked UNLV followed by Drake and Utah. A little luster was taken off the fast start by the Bulldogs after they lost 74-65 to Arkansas-Little Rock last Friday after holding a 29-22 lead at halftime. The Bulldogs held UALR to just 14.8 percent shooting (4-27) in the first half but allowed 70 percent shooting in the second half (16-23). Foul trouble was a problem for the Bulldogs as they had two players foul out, Brandon Gibson and Olu Ashaolu and two other players with four fouls. The Bulldogs defeated SMU 69-64 and Louisiana-Monroe 67-58 before falling to in-state foe Northwestern State 85-78. Ashaolu recorded 22 points and DeAndre Brown exploded for a career-high 31, but 50 percent shooting by the Demons was too much for the Bulldogs to overcome. The two teams combined to hit 15 of 21 three-pointers in the second, which also saw 40 free throws and 102 combined points. Hawai’i posted another victory over a team from the state of Arkansas, as they dispatched Arkansas-Pine Bluff 70-63, but has lost the two games off the islands. First, they dropped from the ranks of the unbeatens with a 54-53 to Cal Poly on a disputed last-second Mustang basket. They followed that up with a 78-57 loss to BYU in Salt Lake City. The Warriors lost senior big man Bill Amis to a stress fracture during the week leading up to Thanksgiving, and he will remain out for around five weeks. His absence wasn’t noticed as much, given the strong work of Vander Joaquim (16 rebounds) against Arkansas-Pine Bluff, but the stability provided by Amis was certainly missed in the two losses. The Warriors return to the friendly confines of the islands, as they’ll host Hawai’i-Pacific and Chicago State before a very tough Christmas test sees them participate in their holiday Diamond Head Classic which will feature No. 11 Baylor, Mississippi State, Washington State, Florida State, Butler, Utah and San Diego battling over Christmas week. Believe it or not (based on recent history), the Rainbow lead the WAC in field goal shooting at 47%, rank second in field goal percentage defense at 40% and is cruising in three-point shooting with a 38% mark. On the boards, UH tops the conference with a +9.1 figure. The Spartans have lost two of their last three as they dropped an 82-77 decision at CS-Bakersfield, then won 80-77 at home against UC-Riverside behind a 35 point night from Adrian Oliver, but fell 72-63 to future WAC member UT-San Antonio. A trip down to Orange County most recently resulted in an 85-70 victory over Big West Conference foe UC Irvine. Friday brings Santa Clara coming over from crosstown for a rivalry game. SJSU leads the WAC in scoring offense at 74.4 points per game and free throw percentage at 79%. Oliver is averaging 24.9 PPG but needs to get more help from his teammates as Justin Graham at 15.0 PPG and Keith Shamburger at 11.1 PPG are the only other two in double-figures scoring per game. Frontcourt newcomer Wil Carter is tops in rebounding at 9.7 per contest. It’s all west coast teams from here until the start of conference play and the Spartans will have two of their next three at home. Don’t look now, but the Vandals have won four in a row, currently the longest winning streak in the WAC. Idaho became the third WAC team to beat Eastern Washington this year, as they rebounded from their pasting at the hands of Montana to hand Eastern Washington a 70-60 loss. Deremy Geiger scored 24 points for Idaho in becoming the sixth different Vandal to lead the team in scoring. Idaho swept the Basketball Traveler’s Classic in Moscow (casual readers, calm down – that’s Moscow, Idaho) as their victims included North Dakota (63-42), Monmouth (69-66) and Eastern Michigan (75-60). The Vandals travel to Seattle on Saturday, where they’ll try to improve their record to 4-0 over Cameron Dollar’s Redhawks. The Bulldogs dropped games against Washington State (66-55), Utah (76-63) and Colorado State (87-74) before picking up their first win over a Division-I team, prevailing 74-70 at San Diego. The Bulldogs trailed WSU by just four points with a shade over four minutes remaining but could not draw any closer before falling by 11. The game against Utah was a rout all the way. The Bulldogs trailed by 11 at halftime and by 24 with 12:00 left in the game. Greg Smith had just nine points and five rebounds in 35 minutes of play against the Utes. For a team known for offensive prowess, the Bulldogs rank last in both scoring offense at 64.3 points per contest and free throw percentage with a jaw-dropping 57.8%. Yes, you read that correctly. Smith is shooting a very respectable 57% to date but has only 33 attempts in six games and is averaging 8.8 PPG. That has to change — within the context of a team effort — for the Bulldogs to turn it around. The ‘Dogs will try to make it two in a row over the West Coast Conference as Pepperdine comes in on Saturday. It’s just Fresno State’s third home game of the season and starts a five-game homestead that will take them into conference play. Things aren’t getting much better for New Mexico State, as they were swept by their I-10 rivals and lit up by UTEP guard Randy Culpepper who scored 32 points in his Battle of I-10 swan song. The Aggies also lost starting center Hamidu Rahman to a calf injury in practice and has missed two consecutive games. His status is day-to-day (aren’t we all?). The Aggies lost the first half of their rivalry series with in-state rival New Mexico in overtime 84-78, rallying from an early 17-point hole in the first half. New Mexico has now won six straight in the series and with a trip to The Pit looming on Saturday, it’s not looking good for the Aggies; New Mexico State has not won in Albuquerque since 2002. The Aggies can take some solace in some improvement in their play. The Aggies played both rivals without sRahman (9.2 PPG/5.3 RPG) and were in the game right down to the wire. There is still no news on the potential return of preseason All-WAC forward Wendell McKines from his ankle injury. McKines has been sidelined the entire season after suffering the broken ankle in the first week of practice. The struggles also continue for the Wolf Pack, as they were handed an 82-65 loss by South Dakota State on the road and then lost 82-70 to rival UNLV and 64-61 at Houston. No Pack player played more than 26 minutes in the loss against South Dakota State. Head coach David Carter emptied the bench, with 12 different players seeing action and 11 of the 12 seeing at least ten minutes of action. Nevada shot 48.9 percent (23-47) but could not overcome 23 points from the Jackrabbits’ Jordan Dykstra, who finished 8-12 from the field, 2-3 from behind the three-point line and 5-7 from the free throw stripe. A poor first half doomed Nevada against UNLV as 20.8 percent shooting gave way to a 21-point halftime deficit. Nevada led Houston at halftime by a single point, but UH scored the second half’s first basket and never relinquished the lead, sending the young Pack to its seventh consecutive loss. Nevada could potentially lose four of their final five with Arizona State, Portland State, Washington and Portland on tap before WAC play begins. One reason for Nevada’s struggles? According to Ken Pomeroy, they are the nation’s least experienced basketball team (via Reno Gazette-Journal’s Chris Murray). Another issue could simply be a few whiffs on the recruiting trail As this blog post notes, recruiting top-flight talent to Nevada hasn’t been a concern in ten years, but Carter has his work cut out for him on couches across the region. The WAC’s competition level takes a step down with teams wrapping up finals and preparing for the last of non-conference play. WAC play starts the final week of December this season, the earliest start in recent memory. The likes of Arkansas-Pine Bluff, San Francisco State, Houston Baptist, Eastern Washington, Hawai’i-Pacific, CS-Bakersfield litter the schedule in the coming week.